1. I went to Edmonton for Stix in the City, (put on by the lovely sisters at River City Yarns) and it was pretty great. 2. 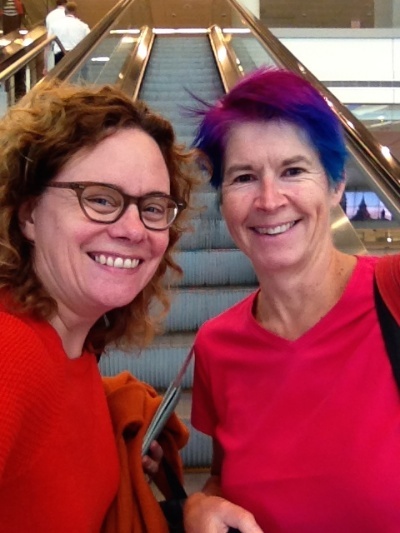 I knew it was a good omen when I ran into Lucy in the Toronto Airport – Me, heading west, her home east. 4. 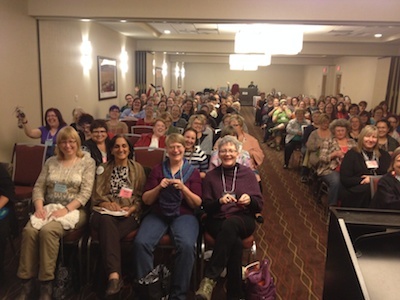 These are the nice knitters that I gave a talk to on Friday night at the “Comedy Club”. 5. These are the very, very nice knitters who brought their first socks, and then I took their picture, and then I wrote down their names onto a little piece of paper and put it in my pocket so I wouldn’t lose it. Which I have done. Tell me you names in the comments ladies, I’ll fix it. I blame Fox Paws. Now, if you’ll excuse me, I have a fantastic date to go on. 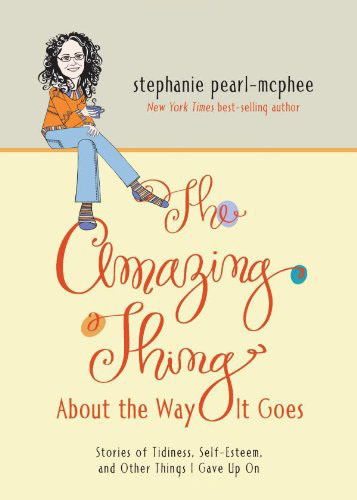 It involves – well. I’ll tell you that tomorrow too. I am keen to know what you think of the knitting involved in Fox Paws. It’s beautiful, but…am I up to it? Fox Paws is a very challenging knit. Mostly because it just isn’t social knitting. Never will be. But there is errata. What version of the pattern do you have? Did you read all the notes on Ravelry? Never attempt above a 3! I agree! And I thought Eala Bhan looked like the toughest knit on Revelry. Looks like a good time! Can’t wait to hear about Fox Paws. Are you finally relaxing at home after a busy few weeks? When you call a pattern pretty challenging what hope is there for us mere mortals!?! Stephanie, are you aware of the update to Fox Paws on Ravelry? Thank you so much for coming to Edmonton, Stephanie! I’ve been enjoying your writing for a while now and am so happy to have had the chance to hear you speak in person and take a class with you. I learned a lot and laughed even more. Thanks again. Fox Paws is sooooo addictive, I made two. I haven’t made it past row two yet! Normally I’d agree, but “groupie” does have another connotation that we might not want to associate with. 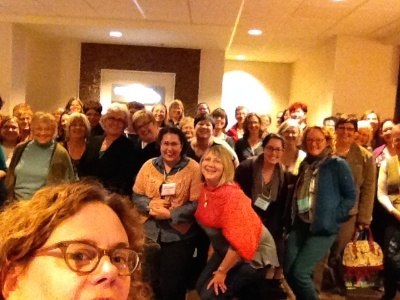 Maybe an “ussie”? Sounds like you had a wonderful time and I am anxious to hear more! A mystery date? How exciting! I wish you hadn’t said that about Fox Paws….it’s intimidating. But truth is true. Thanks so much for coming to Edmonton! It was so much fun and so interesting. I’ve been lever knitting a 1×1 ribbed scarf. It still feels weird but I’ll get it. Feel free to come by again some time. Edmonton loved having you. Apparently, not only did you and Lucy get the memo about where and when to meet, you were also apprised of the required uniform. I agree with Lisa–if Stephanie thinks a thing is challenging then there is no hope for me and having seen the picture, I am sure of it! Another nice thing about going to talks about knitting – no one gets upset if you are actually knitting during the talk! I used to knit in seminars in grad school. No sweat. Once, later when I was working, I was asked to sit in on a meeting because I had the ‘institutional memory’ they thought they might need. I took my knitting. Someone who was passing by saw me through the window, and had a hissy. It was nice, mindless stuff too, so helped keep me awake, but try to explain that to a non-knitter. Just looked at the pattern on Ravelry. Notes say there is an update. Thanks so much for coming to Edmonton, we had an absolute blast at the comedy club! Fox Paws looks like twelve kinds of crazy. Lovely, but definitely cute trouble. I know my limits so Fox Paws is not something I ever would have attempted. Still, I look forward to your adventures, much as I enjoy reading about and watching films about people who climb Mt. Everest. Hi, someone on ravelry linked to this in the fox paws KAL thread. It’s a difficult pattern, especially when you just start so I’m available by Ravelry PM or email to provide help and answers or just moral support. The KAL group is also a great resource. So please do get in touch if you can’t find the answers online. My goal is to give you interesting stuff to knit, not to drive you all crazy . 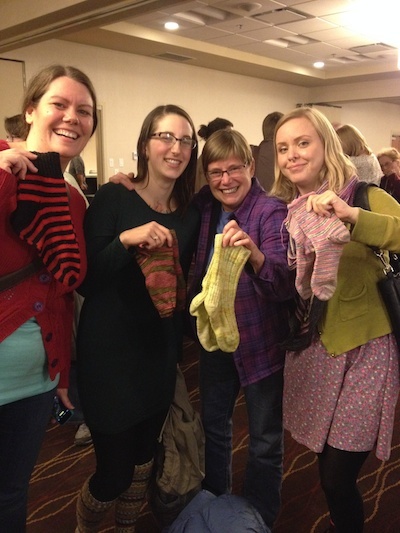 Love pics of happy knitters, and these look almost absurdly jolly! It really must have been a comedy club! what have you done? Now I want to knit fox paws. Am I mad (well, that is a rhetorical questions)? Can’t wait for your censored post on it tomorrow. I want to knit Fox Paws (I reallllly want to knit Fox Paws), but I think I’m going to wait and let everyone troubleshoot it for me. I need to get some boring knitting on my needles first anyway, and that won’t happen until I cast on my next sweater and get to the body of it. Love River City Yarns. I get to Edmonton at least once a year, and RCY is always on my list of places to visit. 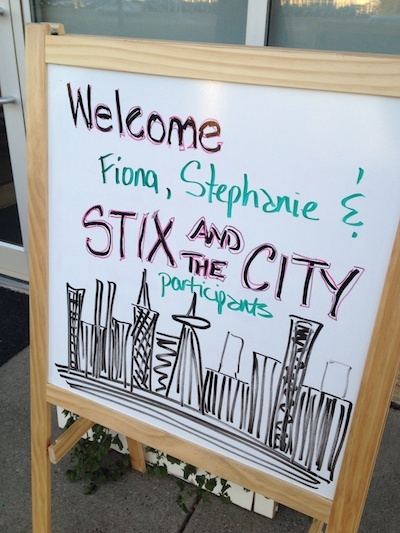 One of these years I’m going to be there for Stix in the City. I know y’all are having a wonderful time. Girlfriend, this proves that you are a much more patient knitter than me! I get the hives just looking at the photos in the Fox Paws pattern. But I know that it will be fabulous coming off of your needles! The anonymous knitters are (L to R) Rhonda, Katherine, Kay, and Angela. And we love you! Thanks for coming to Edmonton. Awesome group of first socks! Very impressive! You are a tease Ms. yarn Harlot! OOOOOOH! I know who your saw today! Can’t wait to see more photos! So, since you always twiddle with a pattern and only so rarely follow it exactly as is, would that make it into a Faux Paws? Thanks for coming Stephanie! Your talk on Friday night was hilarious. I haven’t laughed that hard at good clean humour in a long time! Question for the masses… there was a lady at the comedy night in a brown t-shirt with a wonderful green scarf over it, but I didn’t get a chance to talk to her… anyone know who she is? I want to get my hands on that pattern and make that scarf! I wasn’t wearing a brown shirt though. Might have been something else. SO glad that I went to your talk Stephanie! I can’t wait until you come again. I think that may have been me with the green scarf! Unfortunately, I borrowed the pattern from my aunt in the uk and gave it back without making a copy…she’s since moved and misplaced it :-(…I’ll do some more hunting and let you know if I come up with anything! Looks likes lots of nice knitters in Edmonton. 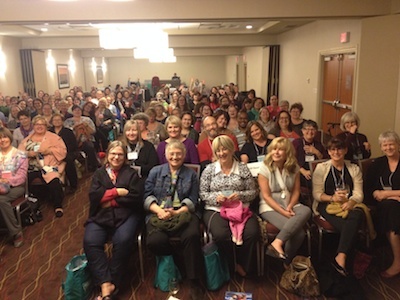 I just wanted to remind you that there are lots of nice knitters in Cincinnati, in case you ever want to visit a new place. Oh, the blog security asked me to ‘touch the woman’. Hysterical. Please tell us the date involves Prince? There certainly was a very HARMONIC CONVERGENCE in Toronto! WOWIE. Looks like everybody had fun. I’m gonna look up Fox Paws on Ravelry… and then go back to my basket weave baby blanket….. The way to get more people into your picture? Take yourself out of it. The up-the-nose view doesn’thave much going for it anyway. It wouldn’t be a “selfie” if she took herself out of it, now would it? I rather like that she looks like she is photo-bombing her selfie + her students. OK – now I HAVE to get the Fox Paws knitting pattern. Somehow I had a feeling that you wouldn’t get around to posting “tomorrow” after you left us with all those cliffhangers! Dear Steph – I met one of your fellow Toronto-ans last weekend at a conference and he had not even heard of you. Imagine my shock and disbelief! Don’t worry, I set him straight.